s. But now that the party is over, has the hangover worn off? In other words, was the expensive, all consuming effort worth it? Celtic Manor has been operating its 120-million-dollar hotel since 1999, but spent 20-million dollars to custom design the “Twenty Ten” golf course for the Ryder Cup. As part of the winning Ryder Cup bid, Celtic Manor agreed to host and sponsor the European Tour’s Wales Open, and its’ 2.8 million dollar yearly purse, through 2014. “Thanks to the publicity, we no longer have to explain to people where Wales is,” said Jane Harris, who works in media relations for the Visit Wales organization. We talked whilst I sampled a bit of Welsh Rarebit and Cardiff-brewed Brain’s Beer at the historic Great House Inn in Laleston. Wales occupies a small westerly, seaside portion of the same British Isle as England and Scotland. Celtic Manor Resort is 150 miles from London’s Heathrow Airport and 45-minutes by car from Cardiff Airport. Is there any credence to the mysterious voice in the movie “Field of Dreams” which whispers: “If you build it, they will come,” but Celtic Manor’s overall golf bookings went up only three percent following the Ryder Cup. “The Ryder Cup did not bring more American visitors to Celtic Manor,” admits Russell Phillips, vice-president of development at the resort. Did the dreadful weather, which almost washed out the event, scare Yanks from coming? Did the fact that the USA lost the contest contribute to American apathy? 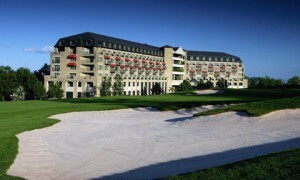 In addition to massive ballrooms and exhibit floor space, Celtic Manor operates its three golf courses out of two expensive clubhouses scattered apart from the hotel. Officials admit if they’d been able to acquire the land needed all at one time, they would have designed and built the resort completely differently. Their next expansion will likely be an indoor water park as they turn their attention to family activities. They’ve already added a rope climbing course and stylish Adventure Golf putting course. Celtic Manor resisted the temptation to cash in on the Ryder Cup by raising the green fees. “Golf rates didn’t change before, during or after the Ryder Cup,” Phillips insists. Celtic Manor does not plan to renew its agreement with the Wales Open after 2014, saying privately they believe smaller, more targeted, made-for-TV events will be more cost effective. Following their push to leverage the Ryder Cup, Visit Wales, according to Harris, has ended the golf promotion division and folded the sport into the general body of the organization. Golf no longer stands alone as a promotional focus, though the event’s glow remains evident. Plenty of images of professional golfers in action and Ryder Cup memorabilia adorn the walls throughout Celtic Manor, and the local cabbie in my car fondly recalls driving winning captain Colin Montgomerie, and the Ryder Cup, to the airport. “It was exciting. And I’m not even a golfer!” he says.